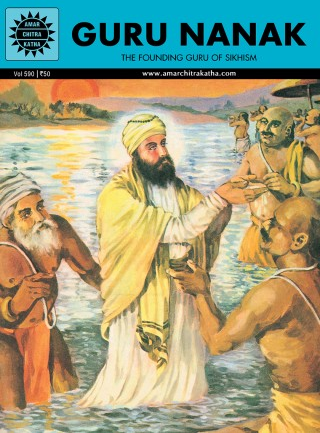 Someone in our congregation lent me a copy of a comic book biography of the life of Guru Nanak, the founder of Sikhism. Aimed at middle readers, I think it would work for older kids (and adults) too — a concise, easy-to-understand summary of Guru Nanak’s life and principles. That comic book is published by Amar Chitra Katha, a publisher with over 400 comic books on hand, with titles like “Guru Nanak,” “Buddha,” “Buddhist Tales” and “More Buddhist Tales,” “Kalidasa,” and “Rabindranath Tagore” (the Nobel prize winning poet much beloved of mid-twentieth century Unitarians). The one I really want to get is the forthcoming title “Valiki’s Ramayana,” a 960 page graphic novel treatment of the Ramayana. Most of us in the West know far too little about this major Indian religious work — and most of us aren’t going to read the full Ramayana, so I’d love to structure an adult education course around this graphic novel. Amar Chitra Katha has lots of comics that would work great for children and youth, too. They have a U.S. branch, so the prices are pretty reasonable.